Well it is that time of year again, when you reflect on the year that has passed and dream about what you hope to accomplish in the new year. If you have set goals before and have failed to keep your New Year’s resolutions in the past, like 80% of people that give up on themselves by February, you probably did not have a plan. A plan helps you succeed. And the best plans are those that track your progress (and failures) and make you accountable. Though a partner is great for all that, it isn’t always possible. You need a method that is simple and fast, like a bullet journal habit tracker. 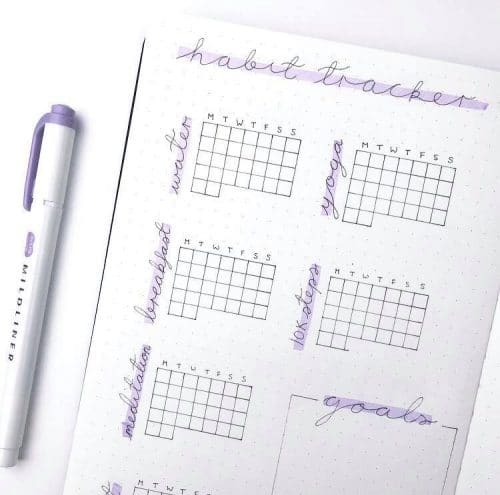 A bullet journal habit tracker reminds you of your goals, helps you see where you need to improve and lets you visualize your wins that you need to celebrate. Now I know you may be intimidated by the whole bullet journal trend out there and you may be thinking that you aren’t artistic or creative enough but hear me out. Bullet journals don’t have to be complicated or fancy to work. The great thing about bullet journals is that you can make them anything you want them to be. They can be daily planners, journals or catch-alls for your thoughts. They can help you set and achieve goals. Bullet Journals can be everything or just one thing. That is completely up to you. 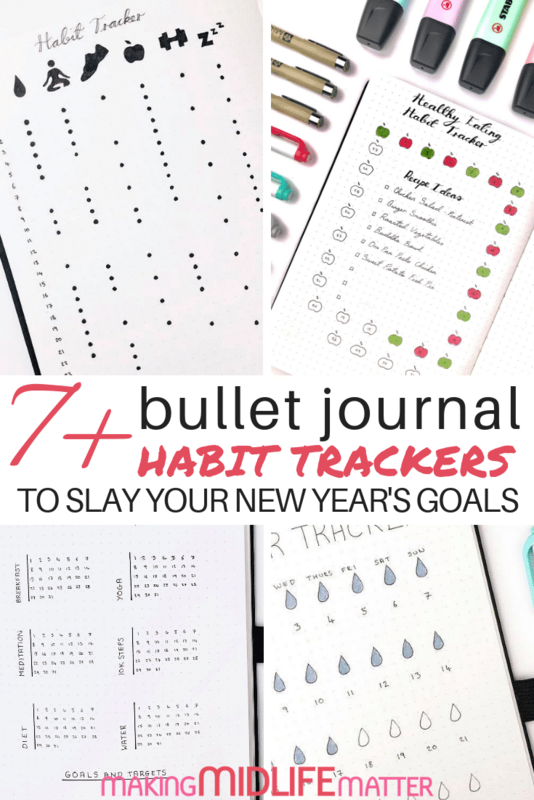 But honestly, even if you don’t have the time or the desire to bullet journal like some of the masters on Instagram, learning how to incorporate and use a bullet journal habit tracker will greatly improve your life, health and goal-setting. 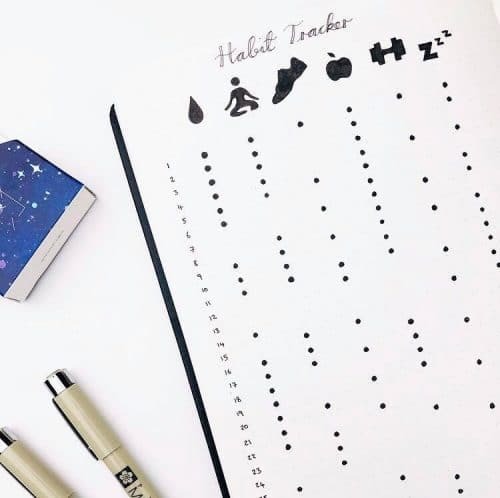 A Bullet Journal habit tracker is a fantastic tool and time-saving way to monitor your daily, weekly and monthly progress at a glance through the use of visuals like graphs. They are the perfect resource for building good habits in all areas of your life by giving you a true understanding of what daily activities are either sabotaging your progress or helping you achieve your goals. Basically they help you stay on track and be accountable to yourself. 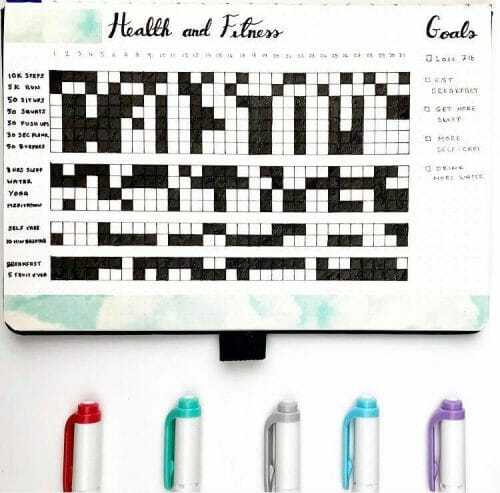 How Do I Choose Which Bullet Journal Habit Tracker To Use? The best thing about a bullet journal habit tracker is that the possibilities are endless. 1. First, decide what goals or habits you wish to improve/work on. Adopt a healthier eating lifestyle. Cut out junk food or sugar. Stick to a diet plan. Take your vitamins or medications daily. Have electronic free days or times. Start and/or develop a new exercise regime. Make more time for self-care with meditation and/or deep-breathing exercises. Take charge of your finances with no-spend days. Make time for Bible reading or prayer. 2. 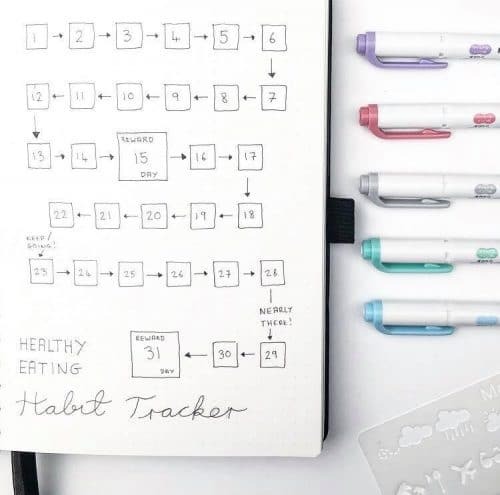 Once you have chosen what habits you would like to track, you can explore which bullet journal habit tracker layout will best suit your needs. If you prefer simple, choose a line graph. If check marks make you feel like you are getting the job done, use those. 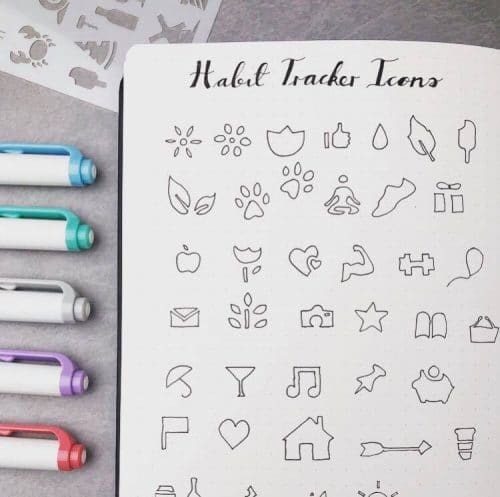 If you like to doodle or colour, choose a bullet journal habit tracker with icons. 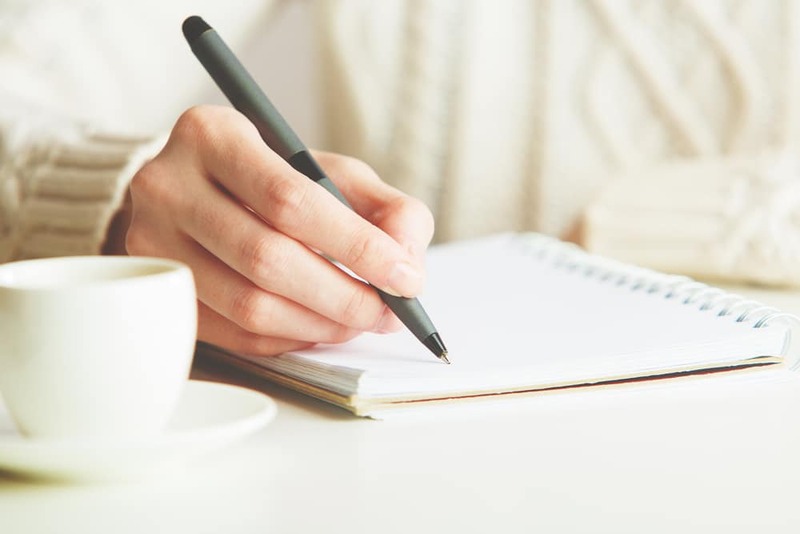 If you have never used a bullet journal before, start with the simplest tracker possible. You can get fancy as you establish better habits. 3. Lastly, choose the frequency of the habit you need to monitor. How many times daily, weekly or monthly do you need to implement your new habit for you to consider it a success? It is best to play around with a new bullet journal habit tracker layout in pencil first on a separate piece of paper. Once you have the design you like, you can duplicate it in your bullet journal. Don’t worry about mistakes in the beginning. Using a bullet journal habit tracker is a learned process. You will get better and you will figure out what works for you. 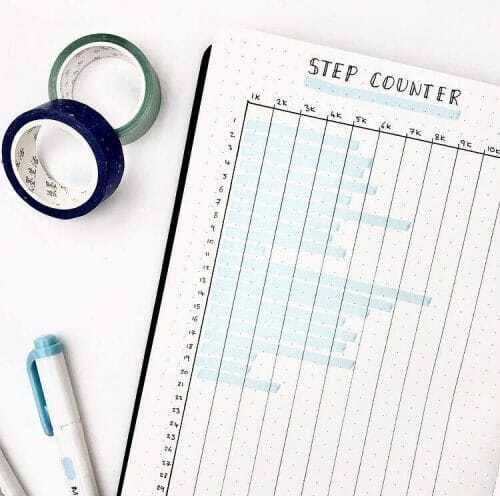 How Can I Ensure Success With My Bullet Journal Habit Tracker? Take it with you every where you go. Your bullet journal needs to be your new best friend. Look at it everyday. Similarly to how a vision board works, keeping your goals front and center in your brain elevates success. Fill it out everyday. 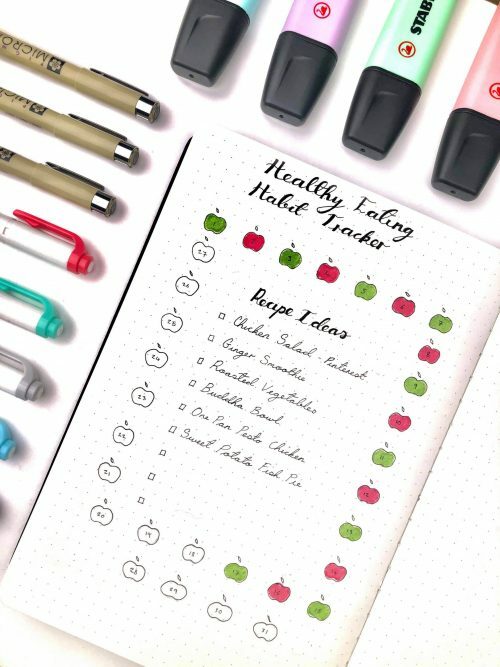 A bullet journal habit tracker will only help you if you use it. Review your progress. Are there any patterns or areas you need to improve? Regularly evaluate all the data and information you are collecting. Adjust. If something isn’t working, change it. Remember, this is your bullet journal. Modify it and adapt it to fit your individual goals. Are you ready to slay your New Year’s Resolutions? Check out the following examples and get started. The number of hours slept are recorded each night by highlighting the time between falling asleep and waking up. It’s a great visual way of being able to see how many hours of sleep are gained each night, whether sleep is continuous or broken and what days of the week allow for more hours of sleep than others. This can also be combined with a mood tracker to see how mood or levels of stress can be affected by the length of sleep. 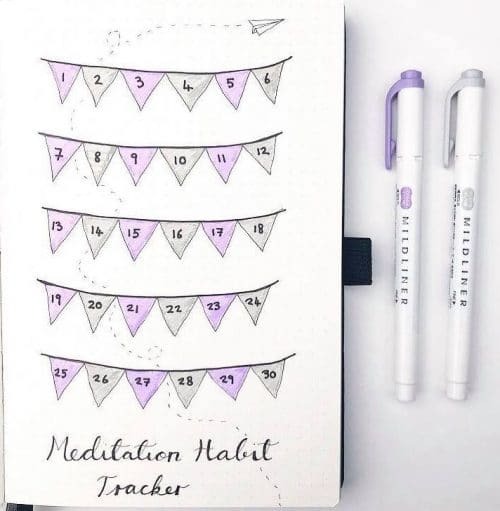 This is a simple tracker that records meditation each day. It can be adapted to suit any theme – the flag/bunting idea would be perfect for a summer spread, and is quick and easy to colour in. An apple symbol represents a single day, with enough for the entire month. They simply need to be coloured in as you go. Don’t forget to log your bad apple days! There is a space in the middle for interesting healthy recipe ideas that you have found. Like the sleep tracker, this is a quick way of recording how many steps are achieved during each day. Just by drawing a line, provides an effective visual overview of the month. Drinking eight glasses of water a day can be symbolized by a simple water droplet, that can be coloured in when the goal has been achieved for that day. It’s incredibly easy to set up and to fill in. As a bonus, you may want to record daily energy levels to highlight the correlation of water and energy. A motivational tool can be created by using a simple square and arrow design. Adding a reward system, reminds you to celebrate your wins. Instead of creating individual trackers separately, you may wish to combine them all onto a single page, saving space in your Bullet Journal. This spread has a section for goals during the month, with the goals being separated into individual grids with one square for each day. These squares are coloured in when a goal has been achieved at the end of each day. This spread is also separated, with the dates for each day during the month set out next to the goal and a space for targets at the bottom. Once a goal has been achieved, the corresponding date can be coloured in, circled or crossed out. It doesn’t get any simpler than that. 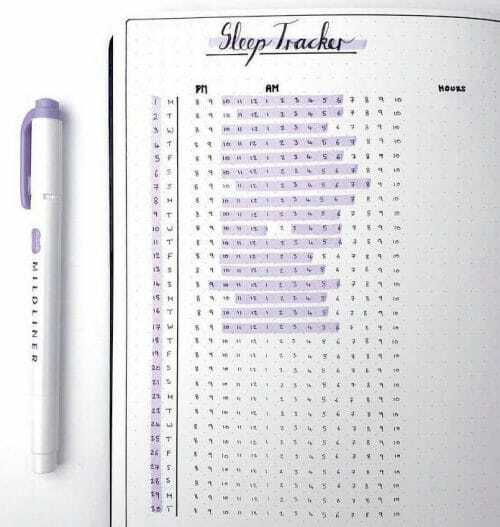 This tracker is looks good and is simple to create. A symbol that represents a goal is drawn at the top, the dates of the month are written down the side and a simple dot is used to demonstrate achievements during the day. This is a slightly more complicated grid to create, but it allows for much more detail. The goals are written down the side and squares can quickly and easily coloured in throughout the month. 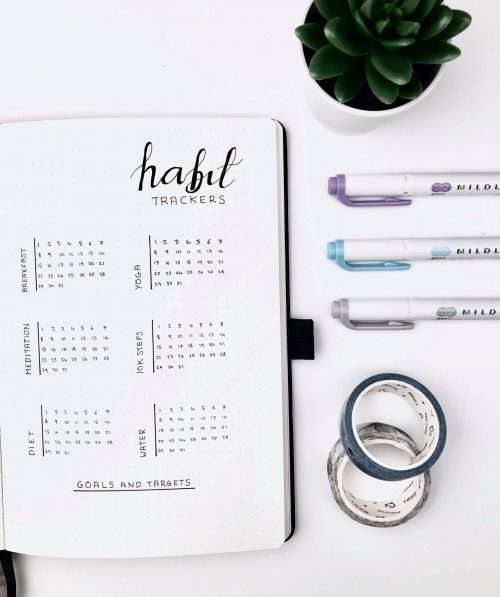 Looking for ideas for you own Habit Tracker? Here are some symbol ideas that can be used in your tracker to represent an activity and day. If you want to know more of my secrets, check out this post: 10 Bullet Journal Hacks For Non-Creatives. Whether you are reading this article in December or in June, there is no time like the present to get started. That is the beauty of using a bullet journal. You can start anytime you want to improve your life. 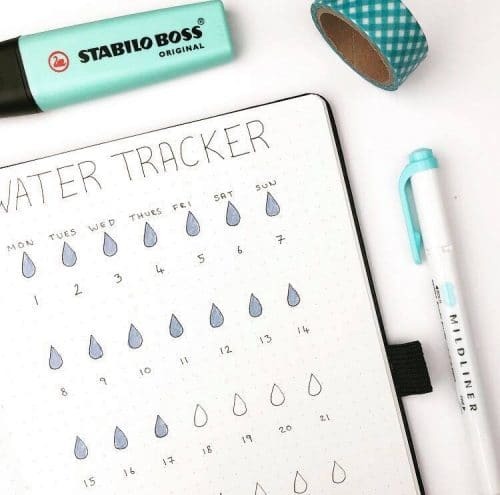 A bullet journal habit tracker may sound simple or old-fashioned but in this fast paced, modern world the ultimate answer isn’t always another gizmo or electronic device. There is nothing like putting pen to paper to get your brain stimulated. Yes, I’m going old school on you here. But why mess with what works.